Detailed review of Sundown Naturals Probiotic Balance. See how this probiotic supplement compares against all the others! 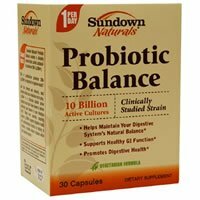 Overall, Sundown Naturals Probiotic Balance is just an average probiotic (hence the 2.5 rating). It’s not my favorite but I do like some aspects of this supplement. Some things that I like are that you only have to take one capsule per day (nice and easy) and the capsules themselves are smaller than average. I also like that the capsules are vegetarian and have 10 billion probiotic cells in each, which can make for a good daily supplement. What I don’t like about these capsules is that they contain MILK and SOY. They also aren’t safe for kids and the company lacks a satisfaction guarantee. Also keep in mind that these probiotics need to be kept refrigerated after opening and should be taken with a meal. So overall, I like that the vegetarian capsules are smaller and you only need one daily but it’s not very allergy friendly, isn’t safe for kids, and lacks a guarantee. Probiotic Balance contains a proprietary blend of 10 billion live cells consisting of two probiotic strains. I like the first strain, Lactobacillus plantarum 299v (Lp299v), because it may have antimicrobial properties, help maintain the permeability of the intestinal tract, and assist in keeping yeast levels in check. Lactobacillus plantarum 299v may also help with the symptoms from digestive disorders such as Irritable Bowel Syndrome, Crohn’s Disease, and Ulcerative Colitis. I like the addition of Bifidobacterium longum because it’s been shown to be anti-inflammatory and may help boost your immune system. Bifidobacterium longum may also help deal with intestinal gas, bloating, and constipation. The allergy concerns with Sundown Naturals Probiotic Balance are definitely an issue. These capsules contain MILK and SOY. The other ingredients include potato starch, vegetable cellulose, and vegetable magnesium stearate. On a positive note, the capsules contain no artificial color, flavor or sweetener, no preservatives, no sugar, no gluten, no wheat, no fish, and no sodium. Probiotic Balance falls within the average price range for probiotic supplements. The cost of a 30 capsule bottle is $18.29. So for daily use, it ends up being $0.61 per day. I’d say this is a reasonable price for a probiotic of this nature. While taking Probiotic Balance, I didn’t see any adverse side effects or belly pain. I didn’t see a guarantee or return policy on Sundown Naturals’ website. I really like when companies can offer some sort of trial period with their products, so this is a big let down for me. To buy Sundown Naturals Probiotic Balance, click here.